If you have kids then one of those things you will worry about as a parent is them getting hurt. If you are a business owner and in particular an arcade operator, then you have to worry about kids getting hurt when perusing a game on the premises as you can be held liable in the event that something goes wrong. Such is the case with a Gameworks in M iami, where four different kids have somehow injured themselves on the machine in the past three years and now some parents are suing after a child’s leg was broken. According to the article describing the injury of one particular child, somehow the leg of the child was caught between the chair and the card-swiper and it broke the child’s leg. I have seen a Turret Tower before but I have never played one and I do not know for sure how it is setup for taking credits and whether or not this particular Turret Tower is modified from the norm. It just seems slightly strange that there would be anything inside to allow for catching limbs while the game spins around. 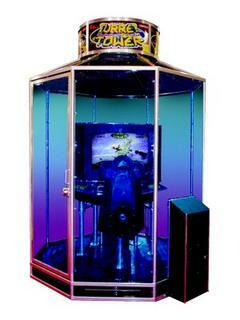 It obviously makes sense to have the mechanism for inserting coins or credits inside of the machine because stopping to get outside of the cabinet to continue can be troublesome (although the article goes as far as to say that it’s done to sucker kids into dumping all their cash into the game solely due to it’s position. Obviously they have never played TT as it’s not THAT great of a game) but what I would like to know is how common are injuries in Turret Tower machines and how many of those are due to a design flaw (either by the game or by modifications) and how many are due to user error. I’m not meaning to downplay the child’s injury at all, that obviously is bad but this game has been around for five years now and these games are tested beforehand to ensure that things like this don’t happen. This entry was posted on June 27, 2009 at 9:02 pm and is filed under Arcade Games. You can subscribe via RSS 2.0 feed to this post's comments. We have one in our facility. One of our top earning games I would say. I don’t know how anyone can get hurt in this machine since it has so many safety devices put in place. It sounds like there card reader stuck out quit a bit off the coin door which is a big no no. We have owned this game on site for about 6 years and had no injures. I feel sorry for the broken leg kid and I kinda have to blame the arcade for not reading the games Manuel that states not to modify coin door for key card systems. I don’t know why people have to beat up on this game since its a Namco product and I work for Namco I support it. If you haven’t played it or don’t understand the concept of the game or how it works don’t play it. The machine (launched in 2000) was developed and manufactured by Dell Electronics, but was exclusively sold by Namco America. The card-swipe unit was an add on by SegaGameworks to the system, and already questions have been raised about the appropriate location and installation (that may have voided the safety of the machine – though this is just pure speculation from unofficial sources. We are the attorney’s representing the injured child in his law suit against Gameworks. We would very much appreciate your assistance in this case.